Engineers at the University of Wisconsin-Madison have developed a type of bioshock bandage that helps wounds to heal by delivering small electrical pulses generated by body movement. Described in journal ACS Nano, the bandage consists of small electrodes for the injury site linked to a band holding energy-harvesting units called nanogenerators. These are looped around the wearer’s torso, with the natural expansion and contraction of the ribcage during breathing powering the low-intensity pulses. It has long been known that electricity can be beneficial for skin healing, but most electrotherapy units in use today require bulky electrical equipment and complicated wiring to deliver powerful jolts of electricity. However, the researchers found that low-power pulses were more beneficial to healing than higher power electricity. In testing on rats, the bioshock bandage reduced healing time from 12 days to just three days. It is hoped the dressing could have a big impact on chronic wounds such as those associated with diabetic foot ulcers and non-healing surgical wounds. 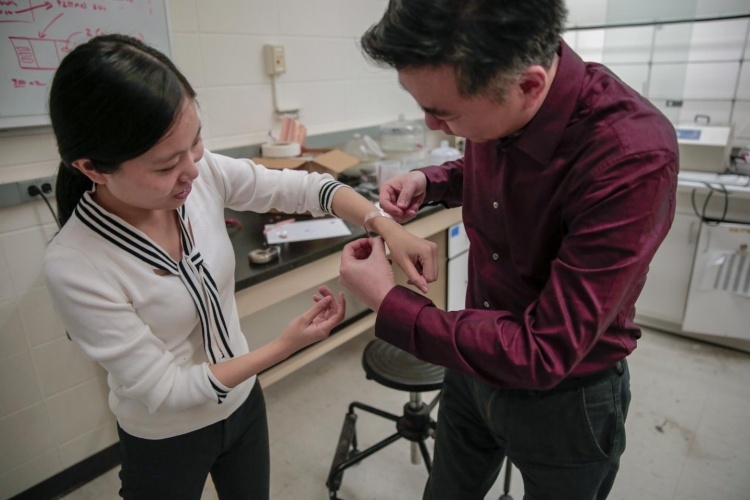 According to the UW-Madison team, the nanogenerators are made from relatively common materials such as copper and polyethylene terephthalate (PET), so the price of the bandage should not be a barrier to adoption. Too mad my dermatologist failed to catch this article and try it on me!! !